We live in a zettabyte era. 1 zettabyte is made of 1,000,000,000,000,000,000,000 bytes. To illustrate, soon the global IP traffic will reach 3.3 ZB per year or 278 exabytes (EB) per month. This amount of data is hard to imagine, not to mention to manage or analyze. Soon businesses of all sizes will have so much amount of information that online data analysis will be the most invaluable resource a company can have. Welcome to the world of interactive dashboards! Take a comfortable seat and enjoy the power of interactive data quality management. Leave your spreadsheets lost in your files, and utilize the advantages of interactive dashboard design and its features. But what is an interactive dashboard and why you need one? In this post, we will explain all the details needed for powerful dashboard creation, and provide tips and tricks to make your business perform even better. Let’s start with a simple definition. Get our free list with the key features of interactive business dashboards! An interactive dashboard is a data management tool that tracks, analyzes, monitors, and visually displays key business metrics while allowing users to interact with data, enabling them to make well-informed, data-driven, and healthy business decisions. Dashboards are used within the business intelligence (BI) environment, creating a link between managers and the company’s strategy, allowing departments to collaborate more effectively, and enabling employees to perform with an increased productivity level. That brings us to our next important aspect. There’s no doubt about it: interactive dashboards provide businesses with insights that have never been possible before. Gone are the days of static presentations, stagnate reports and waiting on analysts to pull reports and then having out-of-date data. Thankfully, it’s also time to take a step back from your spreadsheets and slides. While Excel and PowerPoint, and the various other spreadsheet and presentation applications, remain important business tools for many, their interactivity options are limited. Agility for decision-makers: Interactive analysis empowers users to answer critical business questions on-demand with the most up-to-date data. Additionally, data can be looked from different perspectives and point of views with just a few clicks. Zooming-in and out, detailing time intervals, filtering countries or show and hide specific parameters that you don’t need enables you to look at data in the most holistic way, like never before. Avoid redundant reports: You need only one dashboard reporting tool with the state-of-the-art interactive features to quickly adapt the displayed data instead of creating 10 static PowerPoint slides. Reports use real-time data, with implemented intelligent data alerts that enable users to completely eliminate spreadsheets and presentations. The dashboard will alarm the user every time an anomaly occurs, while neural networks will ensure smart detection and future forecasts. Less IT involvement: By empowering users to perform their own ad hoc data analysis, a company can save valuable IT resources since the number of requests for database queries or customizations will significantly decrease. IT department can then concentrate on other urgent or valuable tasks while business users can get answers on important business questions quickly. Speed: There is no doubt, swiftness today is a crucial element for any company trying to survive in our cutthroat digital age. When using traditional spreadsheets or PowerPoint presentations, data is inserted once and updated manually. With modern reporting tools, there is no need to do so. Real-time dashboards enable real-time data and that is the beauty and power of business intelligence in its core. Therefore, why do you need robust interactive dashboards? Interactive dashboards quickly engage end-users with a wide range of technical acumen and provide an intuitive experience and easily digested insights. They provide ROI by quickly highlighting trends and dig out irregularities. Business dashboards aren’t just for management, they can be easily capitalized on by all teams across a company. They enable you to easily visualize your data, filter on demand and slice and dice your data to dig in deeper. They can also be fun, and here you can see some of the best data visualization examples, most of them made out of stunning interactive dashboard examples. Are you sold on the power of these kinds of dashboards? Before rushing off to buy a dashboard software, or requesting it from the powers that be, there are several important features you should look for. We’ve already discussed the 15 necessary features a dashboard software must have, so we now have to determine our necessary interactive dashboard features. A well-built interactive dashboard provides a variety of ways to dissect data. You should be able to easily explore your data to discover a wide range of insights. A great feature to further enable interactivity is a click-to-filter option. 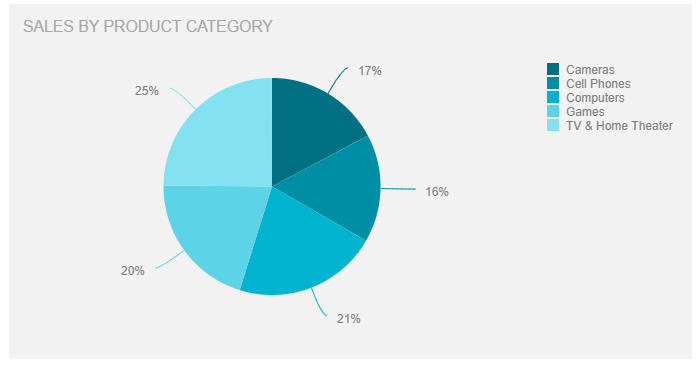 This allows dashboard users to utilize the dimensions of the dashboard’s charts and graphs as temporary filter values. It’s as easy as clicking on any data set in your charts. This action seamlessly creates a quick filter that applies to the data of your dashboard and delivers new insights in an instant, whether it is used on an executive dashboard or operational dashboard. Let’s further explore this interactive dashboard feature. Maps are important data visualizations and at datapine, we love utilizing them in our dashboards. Dashboard maps get even better when using them with click-to-filter. Say you want to visualize your revenue data by country. With click-to-filter, you simply click on a specific country (or countries!) on the map on the dashboard. You then activate this as a filter for your whole dashboard. The data visualized on the dashboard is now just for that chosen country. You can easily click out of it to return to an unfiltered view, or click into another country to access that data. With just a couple of quick clicks, users can easily interact with the data, finding what is pertinent to them. There is now no need to build data visualizations for every country like you would have to do in Excel! This example filters the dashboard for Australia and February using a click-to-filter. You can also click to enlarge. A drill-down is an interactive dashboard software feature that shows you additional, more specific, and detailed information of a particular element, variable or KPI, without overcrowding the dashboard. 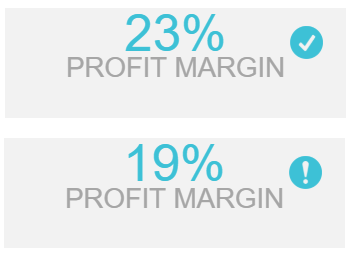 Imagine you want to see the exact net profit or sold units of your management strategy. 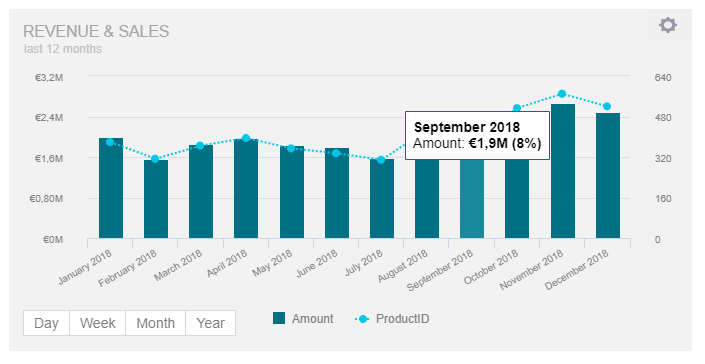 By simply clicking on the specific KPI (in this case the net profit), the drill-down will enable you to visualize this data in a clear manner, without the need to be presented in the main screen. There are many KPI examples you can choose specifically for your business, and this is just one that shows the tip of the iceberg of the power of interactivity. This example shows additional information for the net profit: the top 5 product categories by using a drill-down. You can click to open as a pop-up. Another built-in interactive dashboard feature you should look for is a time interval widget. These widgets allow you to enhance individual time scales on different charts on your dashboards with an interactive drill-down function. 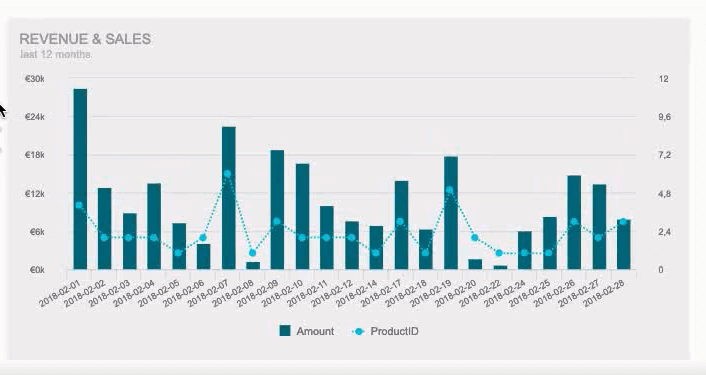 Easily look at revenue & sales across a day, week, month and year time intervals. With a time-interval widget, you choose the time interval of the data displayed on your chart using a date or time field on the X-Axis with a click of your mouse. 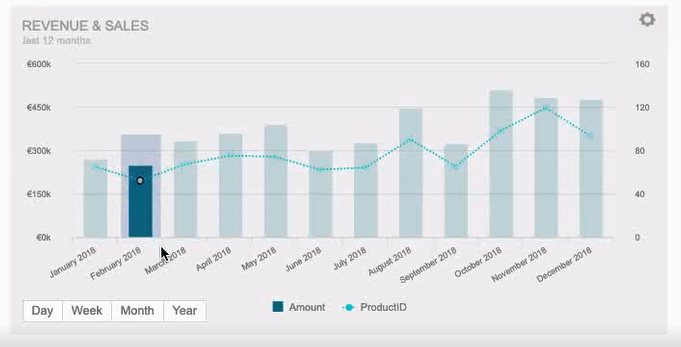 Use this function to move from a yearly to a monthly, weekly or daily view of your data without changing the time period displayed on your whole online dashboard. This is especially helpful if you want to change time intervals of single charts really fast without affecting other data visualizations on your dashboard. Easily look at revenue & sales across day, week, month and year time intervals. You can click to enlarge. While you should be able to open a well-designed dashboard and immediately glean a story, a robust interactive dashboard provides multiple layers of knowledge allowing you to see a 30,000-foot view of your data or zoom into the minute. A chart zoom feature helps you do this. While a time interval widget helps you choose your desired time interval, you may need to dig even deeper. This is when you need a chart zoom. This function lets you drill-down into the smallest unit of time for charts using any date or time field on the X-Axis. Data vizes can provide beautiful representations of your data. While we would all love to see perfect data all the time, that isn’t practical. Data visualization is the easiest way to surface data irregularities. Surfacing these irregularities provides some of the biggest ROI from business intelligence software. A chart zoom feature is an especially useful way to drill-down and investigate your data after finding these irregularities. For example, after looking at the past week using a time interval widget, you identify a day with 50% less daily revenue. Using a chart zoom, you can hone in to see revenue on this day by the hour and look for inconsistencies. Maybe your online shop was down for several hours last Friday. Now, you can easily correlate your downtime and lack of revenue. You can even use these insights to justify investing in a better fail safe! Saving money by zooming in on a chart, that is the power of interactive dashboards. Additionally add sums, averages, percentages, etc. A business often has many datasets and sources. It’s most likely that your data isn’t living in one spot. To further complicate things, the data can also be in multiple “languages”. For example, you may have different SQL databases, Google Analytics and sales data in a CSV. They all host invaluable data for your business. Before business intelligence and dashboard software, it was very difficult to combine these data sources and even harder to analyze them together. Cutting edge, interactive dashboard software allows you to combine and visualize multiple datasets in one dashboard, in just a few clicks. However, when combining datasets, it’s imperative you’re comparing apples to apples and can easily filter across the combined data. Poorly built filters lead to misinterpreted data and misinformed business decisions. 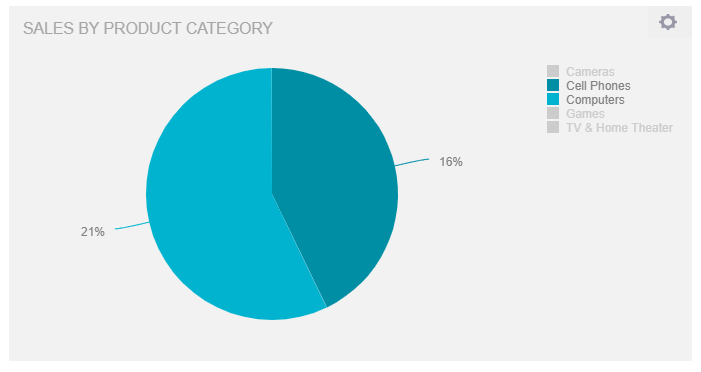 A “show or hide chart values” feature is one of the many ways to better manage blended data. With a show or hide chart values feature, charts containing more than one dataset are presented with a dynamic legend at the bottom. With a simple click on a dataset variable, the data point will be excluded from the charts. This includes the ignored selected data in all calculations of totals or accumulations in your charts. Your business doesn’t live in a vacuum, and neither should your dashboards. Each dashboard created should be a live snapshot of your business. Combining and connecting these snapshots takes your BI to the next level. Dashboard widget linking helps to further unify your dashboards. It enables you to add links to any widget on your dashboard whether it’s a chart, textbox or image and redirects dashboard users and viewers to other related content. You may link to another dashboard tab or even to an external website or resource. Let’s say one of your dashboards contains a high-level key performance indicators (KPI) tab that provides snapshots of all your departments. You then have subsequent more detailed tabs for each individual department. If you don’t have this resource, this is a dashboard best practice and we highly recommend layering your data like this! You can click to open in a new tab. 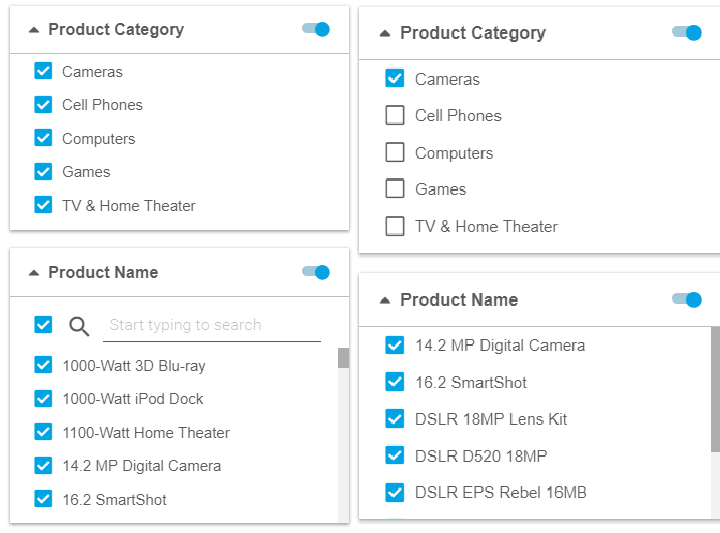 By adding this filter to the dashboard, you can eliminate all products that are not relevant for your current analysis. For example, you are interested only in cameras, so you deselect every other product (like computers or games) that is in your dashboard and observe how the dashboard automatically selects just the cameras in your portfolio. Beside having a standard global dashboard filter (that filters the whole dashboard for selected variables with a few clicks), hierarchical filters help you to manage related filters effectively. Simple, and no manual work needed. If you have an implemented value or criteria that is under your specified benchmark, a clear exclamation mark will show you that this KPI is underperforming and needs attention. On the other hand, a check-mark will provide a clear signal that the KPI is performing well and the viewer will have an obvious cue of the overall metric’s functioning. This filter can then be implemented on various KPIs within the dashboard and provide additional insights for each and every data needed. It is extremely useful since the dashboard itself will alert you if any differences happen, so manual calculations are no longer necessary. It is triggered once you hover over with a mouse which enables you to see, for example, a definition of a specific KPI or notes about the data you need or present on a meeting. This is useful to include in an interactive dashboard design since definitions and specific explanations are available just by hovering, so the user doesn’t necessarily need to remember every little detail s/he wanted to say or explain. We have answered the question of what is an interactive dashboard, provided examples, interactive dashboard features, tips and tricks on how to use them in action and what to look for when choosing your solution. Modern interactive dashboard software, like datapine, is helping to drive business with real-time interactive dashboards. This software is easier to use than spreadsheet programs and provides a wider range of features. With an innovative dashboard software that provides these five interactive features as well as the previously mentioned 15 necessary features, you can prepare stunning interactive data visualizations of your business data. Better yet, you can easily do it on your own with a few clicks and with no advanced IT skills. Don’t believe us? Start your free trial and check for yourself. You can create your first charts and dashboard in minutes.